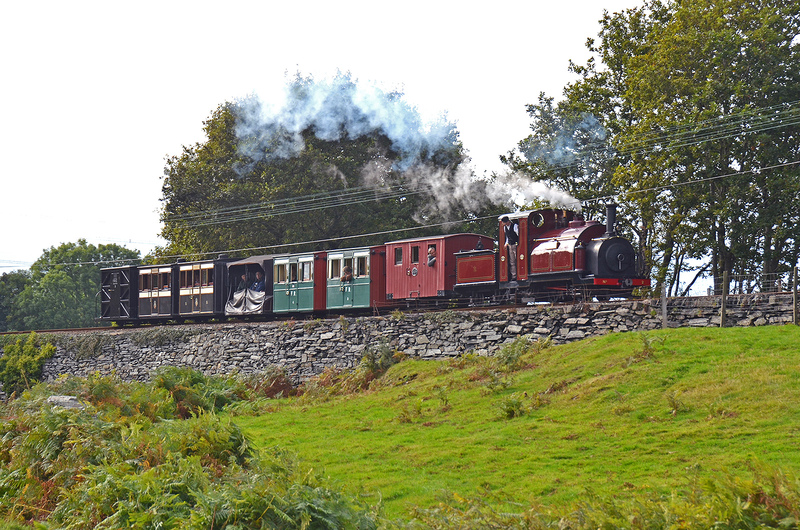 October traditionally marks the last major event of the railway’s calendar, the Ffestiniog’s Victorian Weekend. This year saw the return of the popular gallopers at Harbour Station and once again shops along the High Street joined in the fun with staff in Victorian costume throughout the weekend. An intensive timetable saw appearances by gravity slate trains, Spooner’s Boat and special guest Gerald Dickens – great, great grandson of Charles – put on a performance at Tan y Bwlch on the Friday night and at Porthmadog throughout Saturday (right). Palmerston made a welcome return to traffic in as-yet unlined red livery and Harbour Station was packed with staff and visitors dressed for the occasion. Pupils from Ysgol Eifion Wyn got the proceedings off to a great start with specially-composed songs performed on the platform before being rewarded with a free ride on the gallopers.